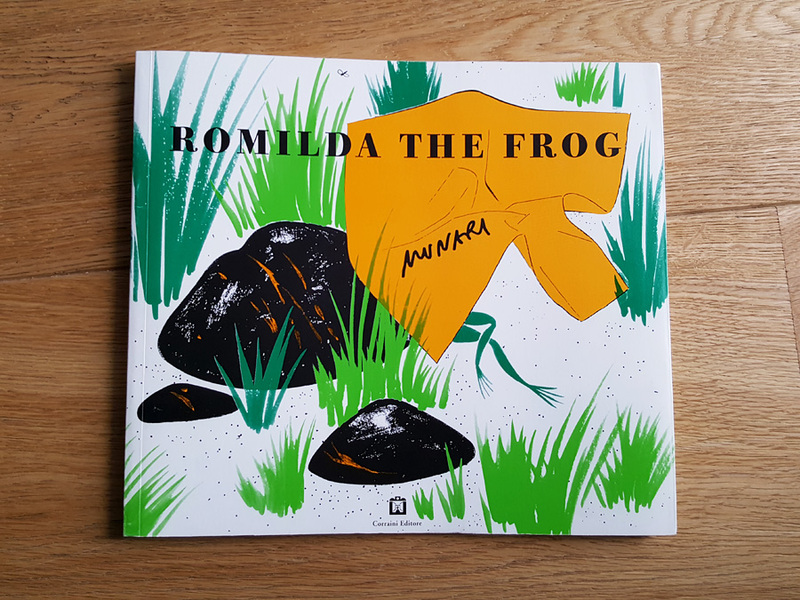 In another of our series examining crucial titles from the bookshelves of illustrators, Alina Surnaite highlights a picture book that formed a staging point in her career, Bruno Munari's Romilda the Frog. It was not easy to choose one book of great importance to my illustration career, but it has to be Romilda the Frog by Bruno Munari, published by Corraini Edizioni in 1997. I discovered it in the exhibition dedicated to this remarkable Italian artist and designer at the Vilnius Book Fair 2012 and bought an English copy a year later at my first Bologna Children's Book Fair. This gorgeous picture book stands out from standard books for this age range because it has 48 pages (instead of 32) with considerably more text and because of its bold and well-designed spreads with a powerful use of white space and a limited three-colour palette. 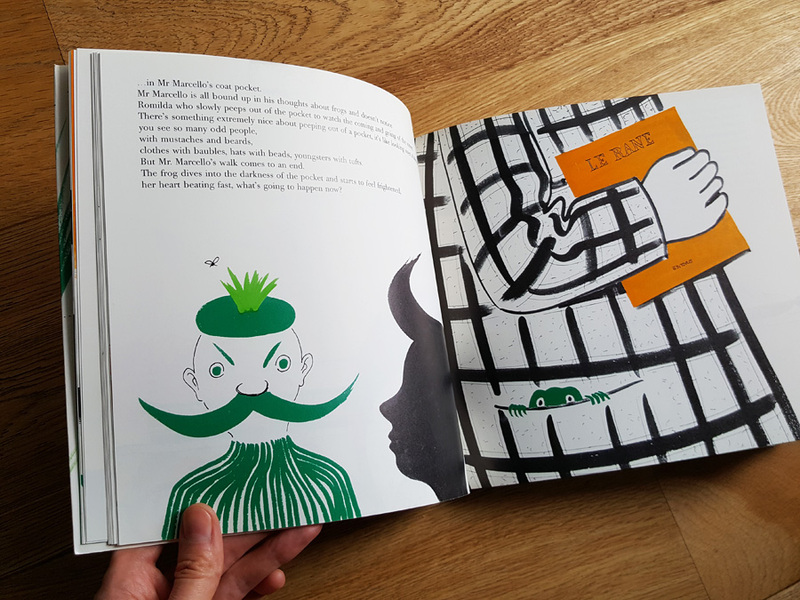 Munari was a very innovative designer who played with the book as a beautiful object and made it very interactive and fun for children. 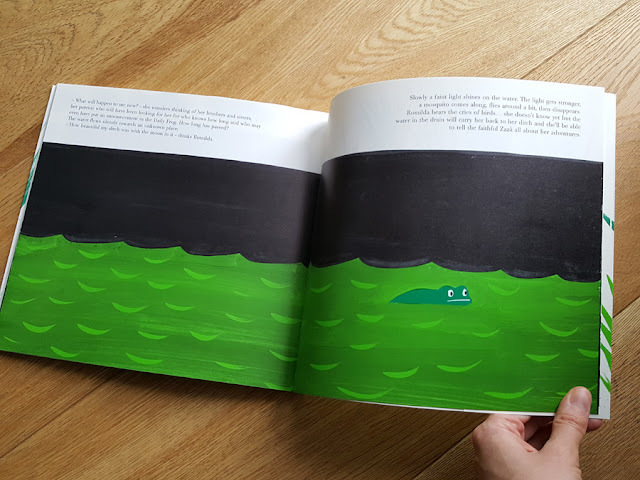 There is a lot of movement and anticipation in Romilda the Frog and the main character is very unusual too, although we have some successful examples these days such as the humorous Oi Frog! By Kes Gray and Jim Field. 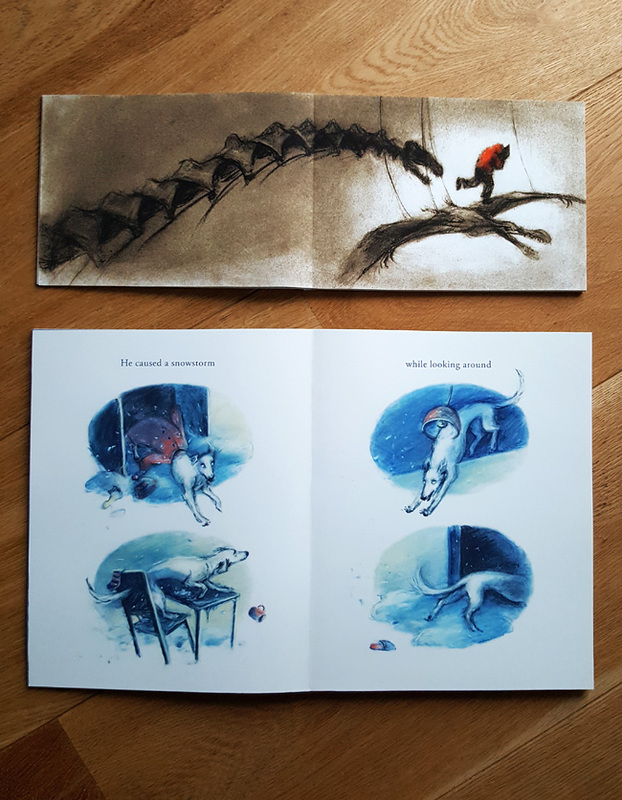 Romilda does not speak however, but the illustrations speak for themselves and portray the emotions very accurately. This must be the first picture book which inspired me to create one of my own, even though such a format was new to me. I had many illustrated books as a child but few examples of picture books, especially those written and illustrated by the same person. 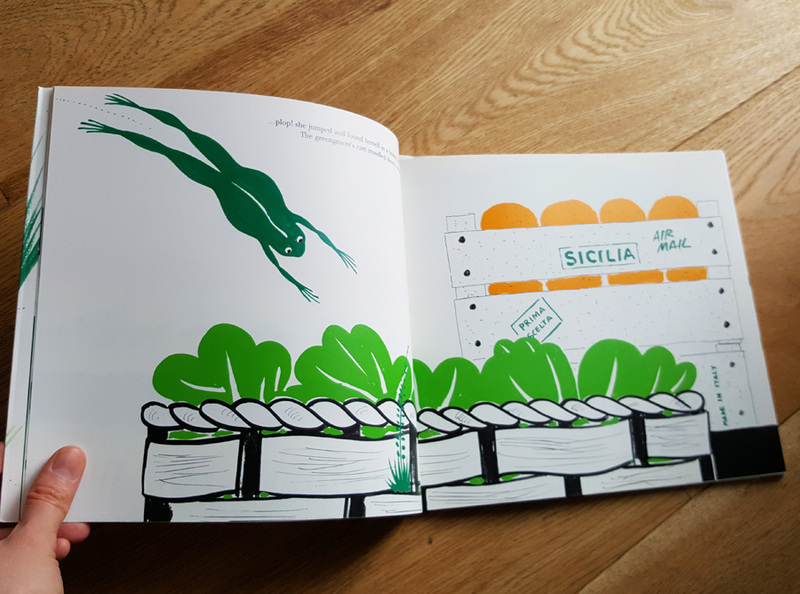 I tried my hand at picture book illustration during my final year at Vilnius Academy of Arts. My first attempt was a far departure from the actual format, but I enjoyed developing a story about a spider searching for home in a block of flats and painting the illustrations in acrylic ink. I believe that the expressive movement of characters was inspired by Bruno Munari's book. My next book looked more like a standard picture book with twelve double-page illustrations and text designed on the page. This was thanks to the Children's Book Illustration Summer School at Cambridge Scool of Art with great advice from wonderful professionals such as Martin Salisbury, Pam Smy, Paula Metcalf, Marta Altes, Alexis Deacon and Axel Scheffler. We had to write a story in advance and mine turned out quite similar to Romilda the Frog, although I did not know that at the time. I also had a frog explorer jumping from one spread to another, longing for adventure, but unlike Romilda, Little Frog did not come back home and discovered a new beautiful place to live instead. I was very pleased to have a full-colour dummy book by the end of this five-day intensive picture book making. That same summer, I decided to study this subject more thoroughly and applied for the MA at the same school. It is three years since I graduated from this amazing course and am very excited to have my first picture book I Love You, Bunny published by Frances Lincoln Children's Books in a few months! 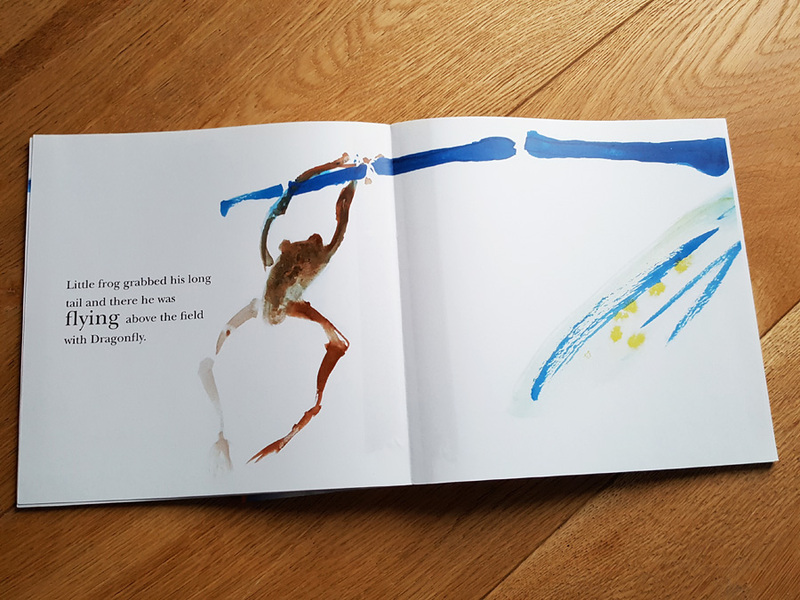 I am very grateful to Bruno Munari and Romilda the Frog for leading me in the right direction and opening the vast and rich world of picture books. My visual language developed immensely since my first attempts in 2012, but the sense of characters travelling or running away from danger is still there. They all have a happy ending, however, as does Romilda the Frog. Alina Surnaite is a children's book writer and illustrator, publishing her debut picture book I love You, Bunny with Frances Lincoln Children's Books in February 2018. 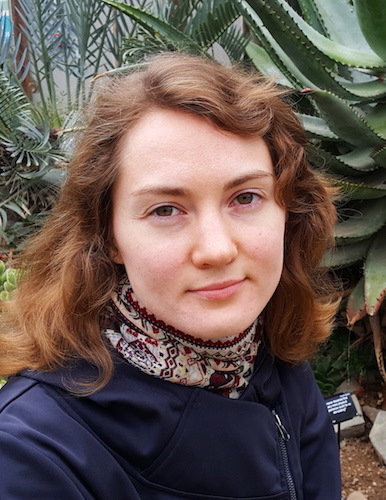 She has been a SCBWI member since finishing her MA in Children's Book Illustration at Cambridge School of Art in 2015 and recently started organising events for illustrators in Cambridge.